Thirty-two emerging leaders in the transportation design and construction industry graduated in the 2016 class of the ARTBA-Transportation Development Foundation’s “Industry Leader Development Program” (ILDP). 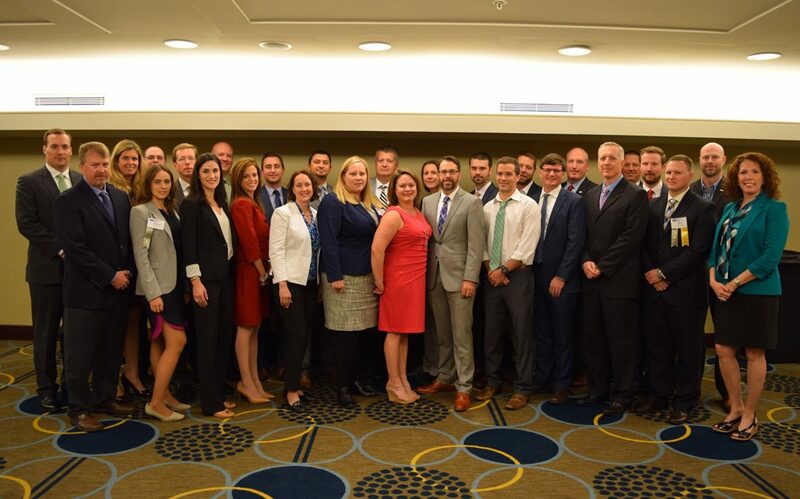 They were in the Nation’s Capital May 9-11 for an extensive “boot camp” introduction to the federal legislative and regulatory processes as part of ARTBA’s Federal Issues Program and the Transportation Construction Coalition Fly-In. The annual gathering also provided participants the opportunity to meet face-to-face with their members of Congress and their staffs to discuss finding a permanent revenue fix for the Highway Trust Fund, the pending aviation bill, and fully funding the FAST Act for FY 2017. The ILDP program has graduated nearly 650 participants from over 200 industry firms since it began in 1995 as the Young Executive Development Program. It provides rising leaders in the transportation construction and development sector with a solid understanding of industry economics, how transportation work in the U.S. is funded and financed, how actions by the federal government impact the industry, and how they – and their company or agency – can become politically engaged to help shape transportation policy. Bret Barton, project executive, Granite Construction, Tampa, Fla.
Jason Brame, transportation technology and CADD coordinator, Larson Design Group, Lititz, Pa.
Chris Carter, senior project engineer, Harms Construction, Farmingville, N.J.
Ian Chaney, supervising engineer, WSP I Parsons Brinckerhoff, Virginia Beach, Va.
Justin Englert, project engineer, Parsons Corporation, Chicago, Ill.
Michael Estes, Mid-Atlantic transportation program manager, HDR, Glen Allen, Va.
Brian Fairwood, principal/regional sales leader, TranSystems Corp., Schaumburg, Ill.
Timothy Fogarty, general foreman, George Harms Construction Co., Farmingville, N.J.
Brent Freeman, area manager, Kraemer North America, Plain, Wis.
Adam Gardner, senior associate/Md. CEI practice leader, KCI Technologies, Sparks, Md. Diana Herriman, project engineer, AECOM, Arlington, Va.
Charlie Hetland, transportation engineer, CH2M, Los Angeles, Calif.
Jennifer Hoffman, director of multilateral relations and risk management, Astladi, Washington, D.C.
Marc Hustad, vice president, HNTB Corp., Lake Mary, Fla.
Craig Klusman, structural engineering manager, AECOM, Louisville, Ky.
William Laird, senior project manager, HDR Inc., Plymouth Meeting, Pa.
Alexandra Lauzon, deputy program manager, Virginia Office of P3s, Richmond, Va.
Gaelen Magee, estimating manager, MAS Building & Bridge, Inc., Norfolk, Mass. Pamela May, performance management engineer, Delaware DOT, Bear, Del. James Minor, milling division president, Swank Construction Co., New Kensington, Pa.
Jeremy Mitchell, project manager, Bell & Associates Construction, Brentwood, Tenn.
David Naibauer, estimator/project manager, Kraemer North America, Castle Rock, Colo.
Jacqueline Peduzzi, project manager/operations manager, WSP I Parsons Brinckerhoff, Chicago, Ill.
Katherine Poole, construction project engineer, RK&K, Washington, D.C.
Josh Revell, project manager, AECOM, Jackson, Miss. Brett Richter, regional manager, Buckley Powder Co., Jefferson City, Mo. Sean Samsel, associate and project manager, Psomas, Tucson, Ariz.
Keith Sommer, senior director, sales, Flour, Greenville, S.C.
Mariana Torres, principal economist, Louis Berger, New York, N.Y.
Matthew Valle, vice president of development, Oldcastle Materials, Newington, Conn.
Amy Walker, area sales manager, Ergon Asphalt & Emulsions, Jackson, Miss. To learn more about the ILDP program contact ARTBA’s Nick Goldstein at ngoldstein@artba.org or 202.289.4434.